Congratulations to Professor Shankar Balasubramanian who has been named a Knight Bachelor for services to science and medicine. He co-invented next generation sequencing which has provided one of the most transformative changes in biology and medicine for several decades, and has led to the $1000 dollar human genome. He has also made important contributions to four-stranded DNA, known as G-quadruplexes, and their role in cancer. 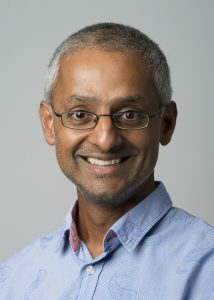 Professor Balasubramanian is Herchel Smith Professor of Medicinal Chemistry in the Department of Chemistry the University of Cambridge, Senior Group Leader at the Cancer Research UK Cambridge Institute and Fellow of Trinity College. It is a great honour for me and a wonderful acknowledgement of the research that I have carried out in Cambridge with my co-workers and collaborators over the past two decades. I was particularly pleased to see recognition of our basic science and its impact on medicine, as I am jointly appointed between the Departments of Chemistry and Medicine.